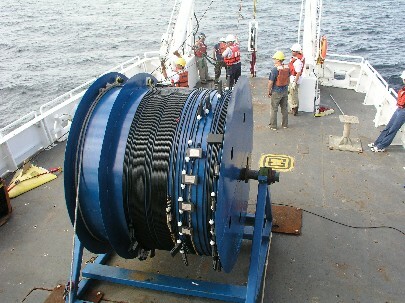 The Towed CTD-Chain makes it possible to accurately analyse the water layering and distribution in the upper levels of the ocean. The towed system with up to 255 CTD-fins is deployed from a ship equipped with an oceanographic winch. The CTD-fins are mounted on an insulated steel cable which is used for inductive data transfer. At the lower end of the tow-cable a depressor insures proper chain deployment at speeds of up to eight knots. The CTD-fins are inductively coupled to the tow-cable which ensures the fins’ power supply and enables communication with the deck unit. This design avoids cable-bunches. Underwater-connectors or pressure resistant housings are not needed. 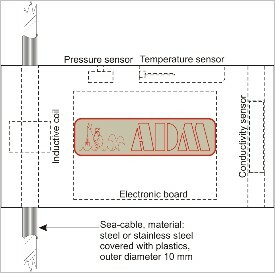 Each fin consists of a 16-bit resolution microprocessor controlled probe with conductivity, temperature and pressure sensors. The sensors are moulded into the fins. 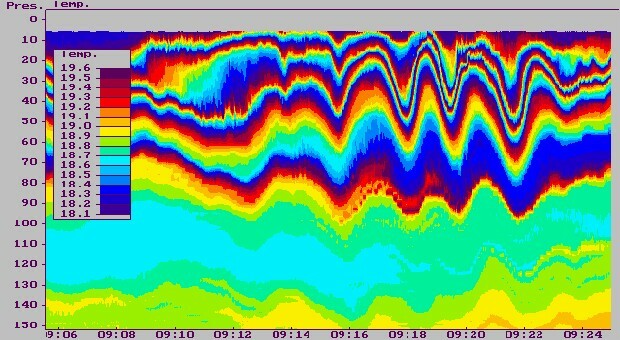 A complete data conversion for the parameters requires approx. 15 ms.
For towing speeds above 3 knots, fairings are installed to reduce drag and prevent vibration of the cable. 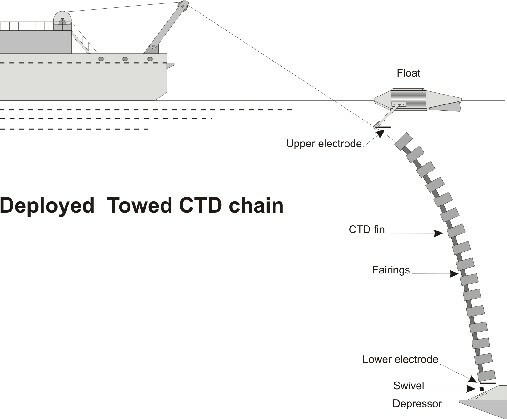 A surface float is towed some 50 m behind the vessel to provide enough buoyancy to decouple the attached chain from the heavy motion. 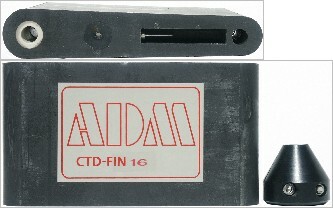 A deck unit provides the current supply for the CTD-fins, enables bi-directional communication and data acquisition. It interfaces with a PC running a software package. On-screen example of a two-dimensional profile measured by NURC (Saclant Centre in La Spezia, Italy) with a CTD-Chain equipped with 50 CTD-fins in the Strait of Messina.